1. No Calvin Johnson. The offense, which is also missing Nate Burleson, just wasn’t the same without him. The run game averaged just 3.4 yards per carry. 2. Matthew Stafford was sacked five times. This, in part, is due not having Calvin as a target. Stafford had to take more time to find open receivers and the offensive line can protect him for just so long. He had been sacked just three times in the first four games. 3. The defense gave up too many big chunk plays — an 83-yard touchdown pass and a 67-yard run that led to a field goal. 4. Chris Houston, who was questionable for the game due to a hamstring injury, didn’t have his best day. But on the 83-yard touchdown he was expecting safety help and didn’t get it. 5. Aaron Rodgers was sacked just once (Ziggy Ansah). In the Packers’ first three games he went down 10 times. The defense did hold him to just one touchdown, but allowed the Packers’ offense to convert 44 percent of its third-down chances. 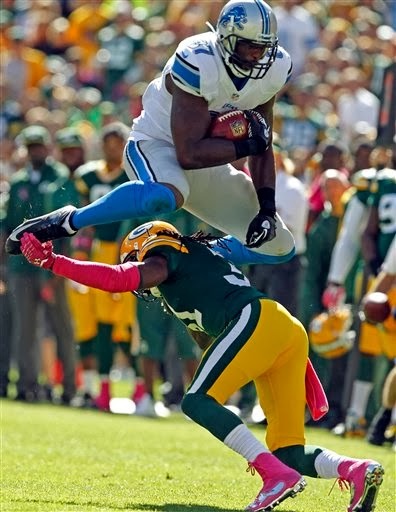 The Lions lost due to missing Calvin Johnson. That allowed the Packers D to shade safeties to the run all game, as well as blitz without any repercussion, because there wasn't a receiver capable of doing any damage. The defense couldn't stay off the field long enough to get a cup of Gatorade before getting back on it, they performed extremely well; blaming them - even in part - for a loss after holding Aaron Rodgers and his Bronco-esque receiving corps to 22 points is entirely inaccurate.